The Chromebook Pixel is the best Chromebook we've ever seen – but then it should be given it costs three times what the competition does. Its smooth, grey industrial lines are accented solely by a thin LED light on the back of the lid that flashes briefly with Google's quartet of red, blue, yellow and green when opened and then glows a pale blue. Mixing modern engineering with a retro shape, the Chromebook Pixel looks fantastic. It measures a svelte 16.2mm thick and weighs just 1.5kg, but the main highlight is its beautiful 12.85in touchscreen. though the lid doesn't fold back any further than this. We preferred using the touchscreen to the all-in-one touchpad, but that certainly wasn't through any fault in the touchpad's design. Rather, the touchpad's smooth surface was a joy to use, and it provided a solid amount of click from almost anywhere on its surface. Multi-touch gestures like pinch-zooming were a little temperamental, but two-finger scrolling worked perfectly. Typing on the Pixel was even more comfortable, as all its Chiclet-style keys were very well-spaced and provided plenty of tactile feedback. It's lost its Function key labels in favour of a row of media buttons across the top of the keyboard, but all of the unique web-related buttons from previous Chromebooks make an appearance here. It also retains a single Search key to help pinpoint your favourite apps and web pages without taking your hands away from the keyboard; that's at the expense of the Caps Lock key though, which is annoyingly relegated to Alt+Search. The keyboard is great, even the layout is a little eccentric. It's not just a fancy screen that sets the Pixel apart from other Chromebooks, as there's some fast hardware squeezed into its tiny chassis to try and justify that price. 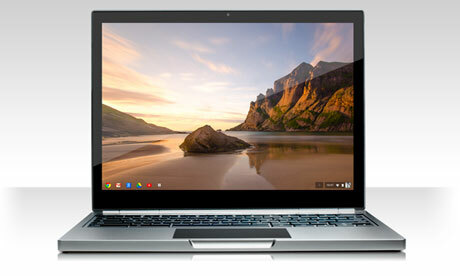 Unlike previous Chromebooks which economised on hardware to help keep their sub-£250 price, the Pixel has 4GB of RAM and a 1.8GHz Intel Core i5 processor. Google has been vague on the exact details of its processor, but it looks to be a Core i5-3427U, the same processor we believe powers Apple's 13in MacBook Air. It felt a little faster in use than the budget Chromebooks we've seen, but nothing to justify its price premium over them. Its graphics are provided by its integrated Intel HD Graphics 4000 chipset. Again, we couldn't run our normal Dirt Showdown tests on the Pixel, but the frame rate was silky smooth in the Chrome version of Bastion, as well as other web-based games like Cut the Rope. Bastion played smoothly and looked better than ever. Its speakers pull off a rather neat trick, considering they're completely conceale inside the chassis, they had more than enough volume, so much so that you can actually feel the sound vibrating through the keys if you raise it above 25%. This can become a little distracting if you like listening to music while typing for long periods of time, but its impressive bass levels added a welcome richness to our test tracks that made it almost worth the irritation. They're great little speakers for when audio quality isn't key, maybe watching a TV programme or listening to radio. Prolonged use made the Pixel rather warm, though we never had any stability problems. Google claim there's a heat sink in there to help keep it cool, but we could feel a lot of heat emanating from both the keys and the back of the laptop, with the top of the keyboard tray getting particularly hot when playing games. We really don't expect this from such a high-end product, although its lack of visible vents certainly cut down on the amount of fan noise it produces. Another disappointment is its lack of connectivity options. Two USB2 ports, a mini-DisplayPort, an SD/MMC card reader and a combined headphone and microphone jack are all you get. It has dual-band Wi-Fi (and Bluetooth 3.0) to help you make the best of Google's web-based Chrome OS. Luckily, you don't have to be online all the time, as we had no trouble editing Google docs offline or reading and writing emails from the Offline Gmail app. That said, even Google devotees will be frustrated that the offline, Windows version of Google's Picasa software is so much more powerful than the Picasa app for Chrome. You can go for it if you want style and real web experience.